Weekly book reviews by the three of us - Adèle Geras, Linda Newbery and Celia Rees - and our guests, all writers or independent booksellers, with occasional special features. We choose our own recommendations: fiction, non-fiction, memoirs, nature writing; in fact anything other than children's books, and not necessarily newly-published. We hope you'll enjoy our selections, and keep coming back for more. Follow us on Facebook, Instagram and Twitter - @writersreview1. Sally Prue is a writer for children of all ages, from picture books up to Young Adult fiction. Her novel Cold Tom won the Branford Boase Prize and the Smarties Silver Award, and Song Hunter won the Historical Society’s Young Quills Award. Her other jobs have included being a Time and Motion clerk, an accompanist, and a piano and recorder teacher. Sally is married, has two grown up daughters, and lives on the edge of a small but very beautiful wood in Hertfordshire, England. She blogs at The Word Den. She is also to be found on her website and on Twitter: @sally_prue. At a young age, disorientated by a relentless barrage of pop music, I decided that life was too short for the blazingly new. Far better, I thought, to ignore books and music for their first decade or so, by which time most of the rubbish was likely to have been discarded. Art, it seemed to me, was more like gold than milk: the best was all too often buried under the worst. The pace of life has increased since then, and this time-scale has shortened; but, although I’m far, far less serious and sensible nowadays than I was when I was young, I’m not sure that I’ve essentially changed my mind. For this reason the current craze among publishers for reissues of old books is very welcome, and I’ve seized upon Hodder & Stoughton’s new editions of Elizabeth Goudge’s books with greedy delight. 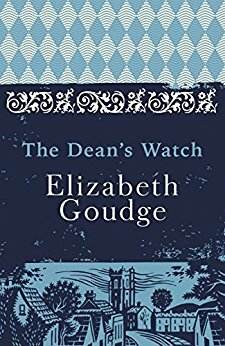 The Dean’s Watch, as I discovered when I picked it up, I’d read long ago, though I had only the haziest recollection of the plot. It’s the sort of book that would be hard to get published as a new book today, both because most of the main characters are in their declining years (though there is one touching and unusual story of young love) and also because the theme is one of faith – and not only that, but some of the faith is religious, at that. Less fashionable still, it’s a story which, while it features fear and frustration and misunderstanding, also embraces kindness and beauty and generosity. It even shines an affectionate and respectful light on obscurity, poverty, mental illness, and even ignorance. His hand never stopped till he had relieved distress. From which it might be inferred that the hero of this novel is not the dean himself, but the maker of his watch; but in fact the dean and the watchmaker are twin heroes: one famous, powerful and feted, one poor, bullied and obscure, each fearful in his own way, both crippled by shyness, and both revolving around the huge brooding cathedral which strikes such awe of different kinds into them both. The Dean’s Watch is the story of how, through what might be called a friendship, they both find freedom. It was written fifty eight years ago. And, like the Dean’s Watch, its gold is still shining. The Dean's Watch: The Cathedral Trilogy is published by Hodder and Stoughton. A lovely review that captures this book perfectly. Thanks so much, Gwen. I always remember my English teacher at school sneering at Elizabeth Goudge, and am glad to have gone back to her and found her such good company. I definitely want to read this. It sounds like exactly what I've been feeling the lack of in recent fiction. Thank you, Sally. It's a book for the refreshment of the mind and spirit, Ann. At least, it worked for me!